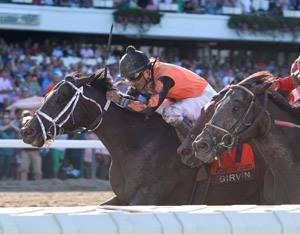 Girvin rallied from last-place to win the 2017 Haskell Invitational (photo via Monmouth Park). Now that the 2018 Triple Crown is in the books, the next big 3-year-old race on everyone’s radar will be the $1 million Haskell Invitational at Monmouth Park on Saturday, July 29. While it is highly unlikely that Justify will return to the races in time for the Haskell, the race, nevertheless, is sure to attract a first-class field of sophomores hoping to emerge during the second-half of the season. In light of this, now seems like a good opportunity to put some focus on the Monmouth Park race meet. Monmouth occasionally gets overlooked in the long shadow cast by summer racing at NYRA, but the track offers a strong second East Coast racing and wagering alternative at this time of year. Monmouth Park began its season on May 5 and is currently racing only on weekends until July 1. The meet will encompass a total of 52 racing days, plus six more all-turf September race dates held at the Meadowlands. In July, Monmouth will add Fridays to expand to three days a week, and, then, will add Thursdays for four days a week of racing from Aug. 2-23. In addition to the Haskell itself, Haskell Day will feature five more stakes races, including four other graded stakes, such as the $150,000 Monmouth Stakes (G2) and a trio of Grade 3 stakes, each worth $100,000 — the Matchmaker, Molly Pitcher and Monmouth Cup. With Justify highly unlikely, but trainer Bob Baffert having a stranglehold on the Haskell over the course of the last two decades, it would not be surprising to see a horse like Solomini headed to the race, or perhaps even early-season standout McKinzie. If you are not familiar with handicapping Monmouth on a day-to-day basis, there is still plenty of time to brush up on what it takes to pick winners at the Jersey Shore. Here is a brief handicapping overview of Monmouth Park, covering just a few of the key basics for horseplayers at the summer New Jersey race meet. Perhaps more so than any other track, racing at Monmouth Park is defined by one predominant factor: speed. As a matter of fact, if you want to know the top three factors, they would be speed, speed and more speed. Thanks to a lightning-fast track surface, tight turns, and a short stretch, Monmouth Park very well might be the most speed-conducive track in the country. Closers are fun to cheer for, but if you’re betting Monmouth and you want to make money — consistently — you must downgrade the closers and bet speed horses and close-to-the-pace horses that are no more than two lengths behind at the quarter pole. The Monmouth Park speed bias is apparent at all distances on the main track. It is greatest in short sprints and gets gradually milder as the distances increase. In short sprints at 5 1/2 to 6 furlongs on the Monmouth dirt, frontrunners win over 34 percent of all races, with most of the remaining winners either pressing or stalking the pace no further than a couple lengths back. The speed bias is a little less pronounced in two-turn routes than it is in sprints, but frontrunners are still good bets at a mile and at 1 mile & 70 yards. While the pacesetter does not win as many of Monmouth’s routes as sprints, horses with speed than can at least press the pace tend to greatly outperform horses coming from father behind. One of the reasons that speed is slightly less effective in routes has a lot to do with post positions, which add another dimension to the two-turn races on the compact oval at the New Jersey shore. The majority of Monmouth’s sprints are run at 6 furlongs, and while the rail (post 1) is the best place to be at that distance, it is not a strong enough bias to prevent the frontrunner(s) from winning from nearly any gate draw (interestingly, at 5 1/2 furlongs, middle posts 4-7 do slightly better than inside draws). It should be noted, however, that speed and the rail in six furlong races is an especially deadly angle at Monmouth Park. In routes, the post positions play a much bigger role in the outcomes of Monmouth’s races. In routes, it is not only important to have speed, but it is also important to break from a beneficial post position. But be careful when handicapping Monmouth routes not to make the mistake of assuming that the innermost posts are always the best places to be. At most route distances, it holds true that the inside posts 1-3 are the best gates to break from. At a mile, however, it is somewhat of a surprise to note that middle posts 4-7 usually do a little better than the three inside gates. This is counterintuitive since one mile races have the shortest run to the first turn and you’d expect the inside bias to be at its strongest in these races. Finally, just as you’d expect, post eight and outward are almost always detrimental in Monmouth routes. On the Monmouth turf course, meanwhile, it is not surprising to note that inside posts are also the best posts, since it follows suit that if the main track has tight turns and a short stretch, then the turf course must have an even smaller and tighter layout. The inside posts are best on Monmouth’s turf course at all distances and the rail post, in particular, seems like the best place to be. Just like on the main track, speed is handy on the Monmouth grass, especially in turf sprints. Speed does well in routes, too, but wire-to-wire types win only about 15 percent of the races, proving that it is tough to lead all the way on grass no matter where you are. Still, while wire-to-wire horses don’t always go all the way, tactical speed is still the key on the Monmouth course, where you at least want to bet pace-pressers that can stay within early striking distance of the leader(s). Jorge Navarro (photo via Jorge Navarro Racing Stable). In the Monmouth trainer standings, three barns are by far the most prominent, starting with perennial leading trainer Jorge Navarro, who already has 20 wins from his first 49 starters for a startling 41 percent win rate. Kelly Breen (12 for 33, 36 percent) and Jason Servis (10 for 18, 56 percent) are second and third in the standings, while also racking up very high winning percentages. The only other trainer approaching the top three in terms of effectiveness is Chad Brown, who has managed to compile a 41 percent Monmouth win percentage (7 wins from 17 starters) so far in 2018 with mostly his second-string of trainees. Todd Pletcher, who had been a fixture at Monmouth Park with his second-string for many years, has not yet been a factor at Monmouth this season. Navarro, who has been the Monmouth meet’s leading trainer since 2013, captured his fifth consecutive title in 2017 and can be counted on for meet totals around 60 wins along with something in the neighborhood of a 35 percent win rate and a 65 percent in-the-money rate. Some trainers, who don’t run as many horses as the top trio but are having very successful meets this year, include Skip Einhorn (4-for-13, 31 percent) and J. Willard Thompson (5-for-14, 36 percent). In the jock’s room, jockeys riding regularly at Monmouth this season include leading rider Paco Lopez (20 wins through June 10) and the usual New Jersey suspects like “Jersey” Joe Bravo, who is selective with his mounts at this stage of his career but always has a high percentage at Monmouth. Jose Ferrer is the jockey in closest pursuit of Lopez, clearly second in the standings with 17 wins. Note, however, that while Lopez is riding at a giant win percentage of nearly 30 percent, Ferrer has a much lower win percentage of 18 percent. Antonio Gallardo (12 wins), Carlos Hernandez (11 wins), and Albin Jimenez (10 wins) round out the jockey standings top five as of June 10. Fast times are in store at the Jersey shore, and it’s all happening this summer at Monmouth Park. Bet on it every weekend until September, follow the trends and winning profiles, and you should come out a winner. Best of luck!